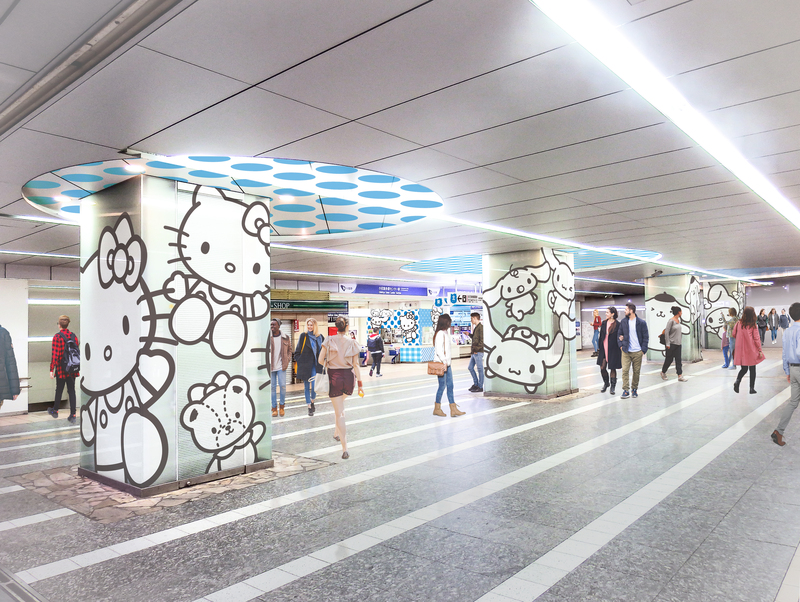 Visitors heading for Hello Kitty Land Tokyo encounter the Odakyu Tama Center Station now with a full Hello Kitty makeover. Platforms and concourse feature over 270 images of some of the most lovable Puroland characters. The project has been driven by Tama City together with Odakyu Lines and Sanrio Puroland with the aim to make the Puroland visitor experience even more special and complete. 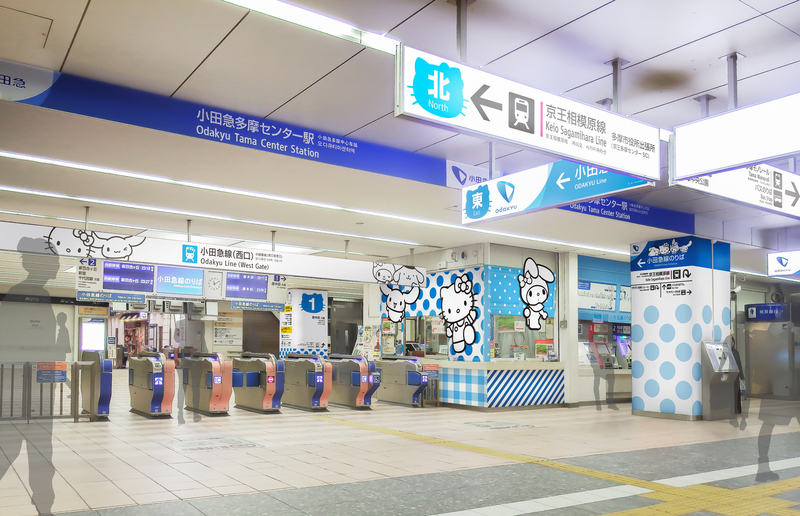 Tokyo, Tuesday 4th December, 2018 ——- Starting from 6th December, 2018, the Odakyu Tama Center Station will be greeting its travellers in a totally new Hello Kitty design. Visitors to Sanrio Puroland, better known as Hello Kitty Land Tokyo (URL: https://en.puroland.jp/), coming by Odakyu Line will find themselves amongst the most endearing Sanrio characters as soon as they step out of the train and onto the platform. The entire Odakyu Tama Center Station has been remodelled and embellished with over 270 Sanrio character designs. The platforms and concourse feature primarily 4 key Sanrio characters including Hello Kitty, who is also the Ambassador of Tama city. The whole of Tama city, the location of Hello Kitty Land Tokyo and only 40min by train from central Tokyo, is embracing Hello Kitty and its popular friends. As part of a regional revitalisation effort initiated in collaboration with Tama City, the Odakyu Tama Center Station is turning into a “Sanrio Puroland Art Station”. Odakyu Electric Railway Company already updated their train schedules in March this year. They increased the number of express trains between Shinjuku and Odakyu Tama Center Station from around 58 to 88 trains per day making the trip faster and more convenient for Sanrio Puroland visitors arriving from Tokyo Metropolis. Tama Center Station is currently the only train station collaborating directly with Sanrio Puroland. Odakyu Electric Railway Company, the railway company running the Odakyu Line, has started this new project as an integral part of Tama city’s CSR (Corporate Social Responsibility) project to help revitalise the area. The combined one-day entry passes range between the following prices: Adults (Over 18): 3,200JPY, children (6-17 years old): 2,400JPY, children between 3 and 5 years old do not pay train fares and will only pay entrance fees. About Odakyu Electric Railway Co., Ltd.
Sanrio Puroland, operated by Sanrio Entertainment Co. Ltd, is also known as ‘Hello Kitty Land’, a theme park to meet and experience its much-loved Sanrio characters including Hello Kitty, which enjoys worldwide popularity. Considered the “Mecca of Sanrio characters”, the park draws great numbers of fans from around the world. Located in the outer districts of Tokyo, Sanrio Puroland is an indoor theme park visitors can enjoy regardless of the weather. Sanrio Puroland also runs an outdoor theme park, Harmonyland, located in Oita Prefecture in Kyushu. *More information about Sanrio Puroland is available at http://en.puroland.jp/. *Sanrio Puroland can also be rented for private and corporate events. Please contact below. We also accept requests and adjustments for coverage throughout the year. Contact: Maaya Kinoshita, Ayako Noda, Bluemoon Marketing Inc.